The County Press archive is and always will be one of the best sources of Island history. It is only newspapers that can afford the luxury of reporting life in all its day-to-day detail, and the back issues of the County Press are full of the facts, events and miscellany of everyday life that goes unrecorded elsewhere. Happily, every single edition of the County Press still exists today in a collection of bound volumes held in the County Press offices. They contain over 120 years of social history recorded in minute detail. 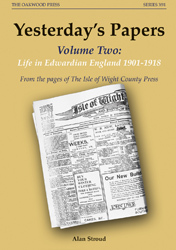 Like the previous volume this book dips into that archive, this time to present a selection of cuttings from 1901 to 1918 that give a flavour of life on the island during those eventful years. By their nature all the items have historical interest. Some of them are amusing while some of them are not so amusing – on occasion they have a foot in both camps. They are first hand accounts of life in the first two decadees of the 20th century, often in the smallest and most revealing detail. The articles were only ever intended to have a life of seven days but with the passing of time they have taken on a new life and become an important resource for historians. Quite simply they are one of the best forms of local history, easily outperforming shelves of conventional history books. The items are all introduced by some background information which will hopefully help put them in historical context but ultimately they stand or fall on their own merit. The columns of the County Press are pure and undiluted history in every sense. A5 format, 208 pages, 37 illustrations.